When I was studying Fashion at LCF, my second year collection was inspired by the textiles of Simone Rocha's father John Rocha. While Simone is following in her father's footsteps, their style, whilst different, unite with the understanding and manipulation of fabric. I attended Simone Rocha's debut SS11 show at LFW through Lulu Kennedy's pioneering non-profit Fashion East initiative. The collection was stunning, I still remember the clean lines, white palette, and cut out panels. It was an instant hit and it is no wonder that four years later the fashion press eagerly anticipate her next collection. For Autumn Winter 2014 Simone Rocha seems at her most playful, the collection features a nod to the Elizabethan era, experimenting with the proportions of sleeves on coats and tops, adding a flouncing effect to create a dramatic silhouette. Short skirts were exaggerated at the hips and belted. One of my favourite looks is the red, sleeveless brushed wool check dress, developed by brushing wool over tulle. This is a further example of Simone Rocha's knowledge of fabric and aptitude for innovation. 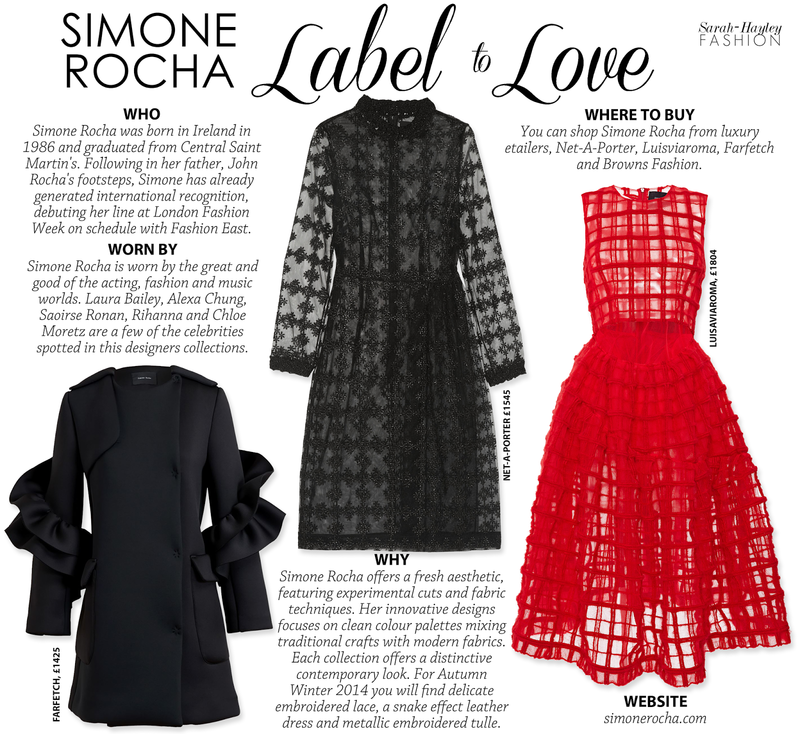 Simone Rocha is a rising star today but most definitely a megastar of tomorrow. Look out for her next LFW show which will be streamed on the site in September. Until then take a look below for a glimpse of the AW14 collection.